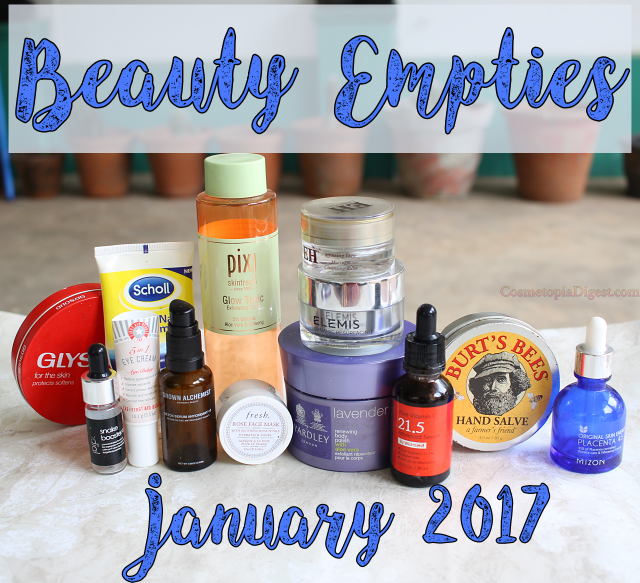 Several products among the January 2017 beauty empties have me torn up on whether to repurchase or not. On the one hand, they are brilliant, and they work. On the other hand, I do have quite a few equally brilliant replacements in my cupboard at the moment. Read on to find out which products. Here are the beauty products I used up in January 2017, and my quick impressions of each. Nice and hydrating. For some reason, it left yellow pills beneath makeup, especially when I used Kevyn Aucoin SSE as concealer. Will avoid, for this reason. A lightweight first serum. Yes, I have taken to layering two or even three serums now. Repurchase? I'm trying to decide between this one and the Mizon Energy Peptide serum. LOVE this. Kills off pigmentation in no time. Sadly, continuous daily use over a period of six months has turned my fingernails a hennaed orange. Repurchase? Despite three full bottles in my 'fridge, I am contemplating moving to Deciem or The Hero Project for Vitamin C - provided they do not stain. We'll see. I think this was my fourth bottle. I use this every now and then, when I over-exfoliate or use harsher actives and need soothing. Repurchase? Ready on my shelves. I used this as a last-step, occlusive all-night pack. I don't know, the smell wasn't too nice to fall asleep to. At night, I prefer mild, soothing fragrances such as neroli, lavender or amber. Amazing is the right word for this. A beautiful, luxurious one-step balm cleanser that removes all makeup immediately and gently. Repurchase? I WANT to. Thing is, there are a gazillion oil cleansers to finish up. 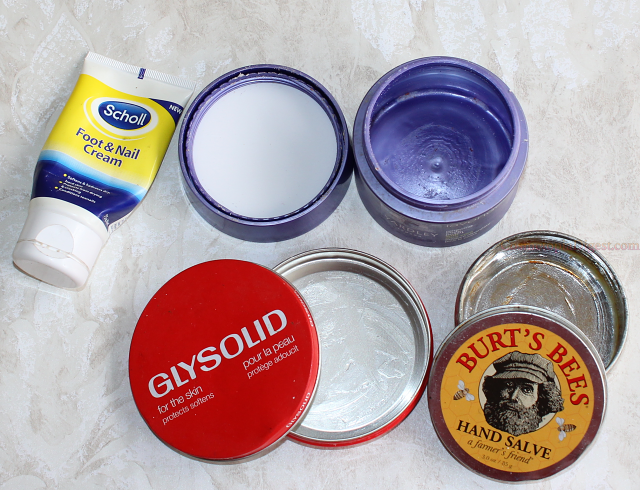 Plus, there are other balm cleansers which do not cost as much. OTOH, this one is the ultimate luxury. Skin decadence. I'm torn - let's see. As far as gentle exfoliating night creams go, this one is right up there along with Alpha-H Rejuvenating Cream. I can't choose - maybe Alpha-H by a whisker because the jar comes with a pump dispenser. Repurchase? Doubtful, for above reason. Incredibly runny. A nice choice if your skin is riddled with acne - I decanted the lot into a spray bottle and used it up as a refreshing mist. Calm down, it does not contain crushed cobras. It does contain Syn-ake peptides, which simulate viper venom for plumping the skin. Much diluted, of course. Repurchase? I'm torn again. 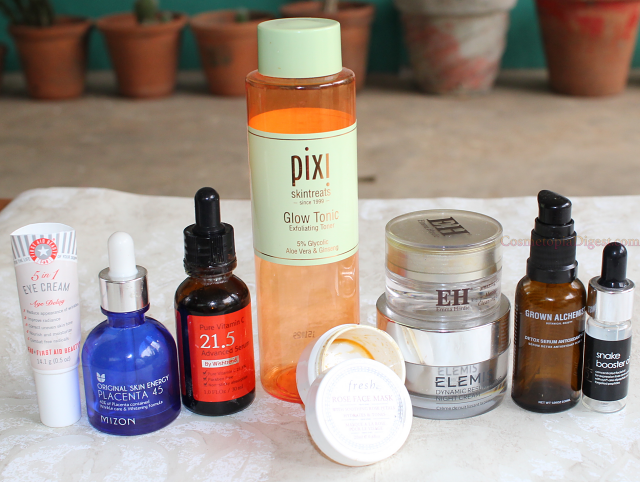 There are so many amazing facial oils I've discovered lately. I will take a call on repurchases once I use up Sunday Riley Juno. I've had this since... well, forever. It went missing, turned up, went missing again, and I finally found it along with the Christmas ornaments (don't ask) and used it up. Not a fan. Didn't do anything. I used it exclusively on my legs after a few weeks of letting my moisturising routine "go to seed", and now my legs are decent. Repurchase? No. Loads of other body moisturisers left. One of the loveliest body scrubs out there. Yardley celebrated their 245th anniversary last year with a special edition lavender soap in a tin. No one does lavender like Yardley! Repurchase? If I can find it, yes. My Dad bought this in Singapore because he wanted the tin! He pretty much insisted that I use it up and give him the empty tin. I've very kindly offered to finish up any tins he MAY want from Givenchy, Guerlain, Dior, Chanel, Estee Lauder, Lancome, and so on. Repurchase? Not unless my Dad wants more of the tins. Of these, the latter was more serum-y, if you get my drift. The Klairs mask was wet, but it did not feel as serum-like. Repurchase? None of these; plenty left. 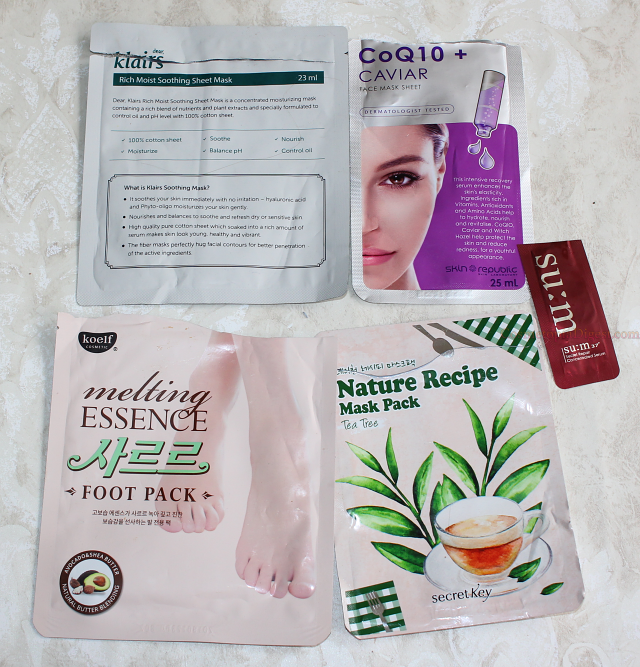 One of the nicest foot masks I've used. Just wear these as socks and go to bed, to wake up to the softest feet in the morning. This was too minuscule a quantity to decide whether it works well or not. I know, there are products where you fall in love after opening a 1ml foil sachet, but perhaps this one makes a difference after 4-5 uses? Repurchase? I want to try their stick cleanser first.